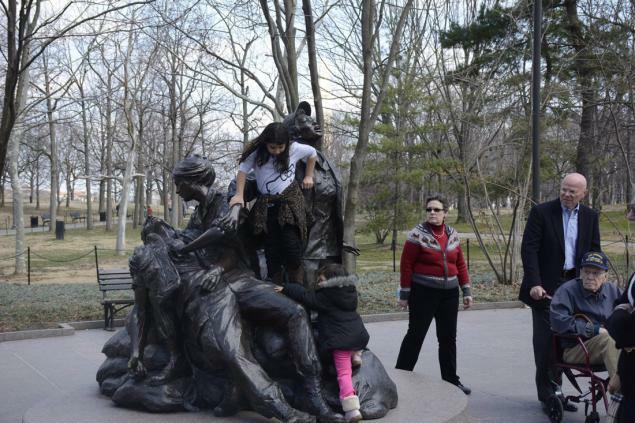 Viral Photo: Kids Treating Vietnam Memorial Like A Jungle Gym - NO RESPECT! Before we get too upset with these little kids for treating this memorial like a jungle gym, let’s remember – they probably have no idea about the war in Vietnam. This is the parents fault! As a parent, how do you stand by and allow your children to defame and disrespects a memorial of a fallen soldier. This photograph was taken at the Vietnam Women’s Memorial in Washington DC. The young children were treating this memorial like a jungle gym with an elderly man looking on, and veterans shaking their heads. Matthew Munson, the photographer, took the photo when he saw an elderly man wearing a “USS Emmons” ball cap approach the memorial while the kids were climbing the sculpture that honors the women who served in Vietnam, mostly as nurses. Munson told the station that the parents were laughing while the kids scaled the monument, which was dedicated in 1993, showing a woman holding a fallen soldier. The photo, which appears on Reddit, sparked debate among users. Some said the children should be taught at an early age to treat these sites with a certain level of reverence. Others say some veterans take pleasure in seeing the generation that they protected take the simple pleasure of running around at one of the sites. “He [a WWII veteran] saw it as a way for the next generation to take some joy out of something so terrible and at the same time gave them a link to the past,” the commentator wrote. In my opinion, I think it’s an absolute disgrace. This current generation has no idea what the previous generation has fought for, and the lives that were lost in doing so.